Have you ever aspired for something that excited you a lot and despaired of later when you realized it’s out of your reach? For someone it could be a chance to study in that prestigious place overseas, for someone else it could be a dream automobile, for someone else it could be that wonderful villa and so on. But can you feel for and empathise with someone who’s ‘lofty’ aspiration could be something as simple (as we perceive) as owning a pair of sneakers or dining at a fancy restaurant? No I am not getting philosophical on a weekday, far from it. But after watching the much appreciated and feted Tamil film twice that’s now the toast of the Country, M.Manikandan’s Kaakka Muttai (Crow’s Egg), I am feeling an odd sense of happiness combined with anxiety, happiness at seeing such a lovely tale unfold on screen and anxiety on realizing how at times we just tend to ignore so many small things in life. 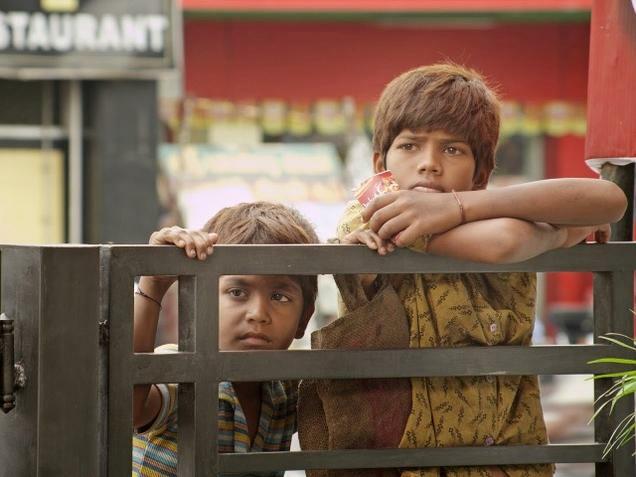 The setting is a slum in the Saidapet area of Chennai where the two kids Chinna Kaakka Muttai (Ramesh) and Periya Kaakka Muttai (Vignesh) live and the story revolves around them. Their father is in jail (for reasons that we never get to know) and their mother (Aishwarya Rajesh) works in a factory to make ends meet. The kids spend their day playing in a ground nearby, consuming crow’s eggs and earning money by collecting coal found lying along the railway tracks and selling it. They have dropped out of school and hence work since their mother is unable to afford their school fees on her own. Things take a turn in their lives when their ground is no more accessible to them; it is sold to a businessman (Babu Antony) who sets up a Pizza joint over there. Actor Simbu aka STR comes in to inaugurate the outlet and as they see Simbu relishing the pizza, the kids are fascinated by this dish which they had never heard of or seen before. A TV commercial and a pamphlet of the same pizza joint further makes the kids fall in love with pizza. They realize that it’s not going to be easy to taste a pizza; after all it costs Rs.300, way beyond their reach. But Chinna Kaakka Muttai and Periya Kaakka Muttai are not just kids who dream, they also know dreams can be achieved if they work hard. Hence they go about trying to make up the money through various means, without really letting their mother and grandmother know what they are up to. In the process they face certain harsh realities of life, see their own companions make fun of them, eventually even stirring a hornet’s nest without realizing it. So do they end up realizing their dream and what happens eventually is what the rest of the film is all about. At the surface it’s a very simple tale, something that most people might at best consider to be short film worthy perhaps. But full credit to Manikandan for his vision and conviction in making this into an enjoyable 110 minute feature film which talks about consumerism, hope and most importantly making us believe in our dreams. Written, shot and directed by Manikandan this is not just a children’s film, far from it in fact. In probably one of the most promising debuts in recent times, on par if not better than Avinash Arun (Killa) and Chaitanya Tamhane (Court), Manikandan’s work deserves all praise, especially in getting the two child protagonists to deliver National Award worthy performances. It’s not the first time we are seeing a film shot in a slum, or seeing a tale based around poor children. But be rest assured, Kaakka Muttai is fresh, slice of life and real enough for you to get connected to. Manikandan focuses on only showing us what we need to know, so for example we never know why the father of the kids is in jail and after a while we do not really bother about it. There are just a brief couple of scenes of the factory in which the mother works, enough for us to know how she runs her home. The rich kid who is friendly with the two protagonists is always on the other side of the fence and they always meet near the fence only. The Chennai we see in the film is basically restricted to the slum and the ground nearby, any deviation like the Pizza outlet or Citi Centre Mall is only when the narrative requires it. All these lay testimony to the fact that the film is basically about the two kids and their life, so Manikandan restricts the visuals also to what’s relevant to the tale. There is a lot of humour in the film, subtle and natural, for a change. Take for instance the part when the two kids decide they could make money by ferrying drunken men home, a total howler of a scene. Another wonderful scene is when the brothers arrive in front of Citi Centre with the aim of shopping for clothes, but stand mesmerized by the sight of the mall and the younger brother exclaims “we definitely would not be allowed inside” in such a casual manner. Also all the portions involving the two small time conmen from the slum involve some wonderful humour on display. It’s also interesting to see Manikandan weave in situations which mirror whats actually happening in Chennai, like ration shops doling out free colour TV’s but running short of rice 🙂 . A lot of credit for bringing alive these scenes goes to the dialogue writers, Anand Kumaresan and Anand Annamalai who keep the dialogues simple, yet clever and tongue in cheek. Manikandan’s camerawork is impressive, captures the world of the two Kaakka Muttai’s with complete naturality. At a running time of 110 minutes, the film is of ideal length and the pace never dips, once again a good example of late editor Kishore T.E’s talent. While it’s good to see Manikandan structuring the film as per international standards, without an interval block, it is also a negative in a way as single screens and multiplexes bring in a forced interval (it happened on both the occasions I saw it in 2 different places) which breaks the momentum. If at all I have any other grouse with the film then it has to be in the way the film leads up to its climax. Believe me when I say that I loved the way the film ends, just that the few minutes leading up to it with all the media frenzy etc. could have been worked out a little better. But this isn’t something which dilutes the impact of such a fine film in any case. G.V.Prakash Kumar’s music fits in well with the highs and lows of the movie, the songs may not be chartbusters but are more than adequate for the tale that we witness in Kaakka Muttai. 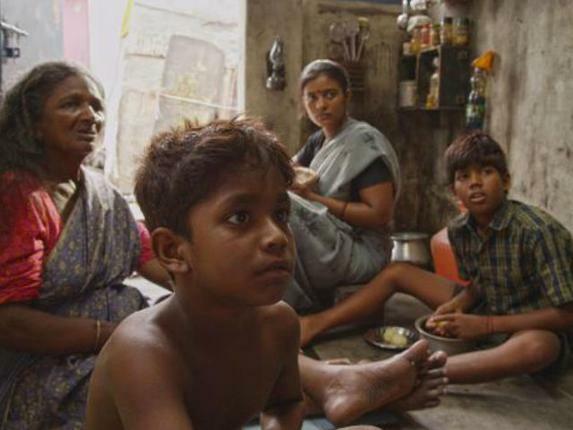 A major reason for the triumph of Kaakka Muttai are the wonderful characters in the film, all of them make an impact irrespective of their screen time. And the choice of actors chosen to portray these characters has been good, something which has worked in favour of the film very well. The old lady who plays the grandmother is such a fantastic find, seeing her go about making her variant of a pizza for the kids is sure to warm anyone up. Krishnamoorthi who plays the pizza outlet owner’s friend with a slippery tongue, Ramesh Thilak and the guy playing his friend are all wonderful, infusing humour at the right places effortlessly. Babu Antony has a dignified presence and it is to his credit that the character he portrays doesn’t end up outright negative. Joe Malloori is very effective as Pazharasam, the elderly friend of the two kids, whose identity remains a little mystery of sorts. Aishwarya Rajesh as the mother of the kids is a revelation, easily her best performance in her career so far, this is also easily one of the best female lead performances seen in Tamil Cinema of late. Look at the scene where the MLA’s right hand man looks at her eldest son and asks her if he is her brother, the way she subtly puts her hands around the boy’s shoulder and says it’s her son is a treat to watch. Her character is one which undergoes a gamut of emotions at various points of the tale and Aishwarya pulls it off quite well. And finally how could the film have been made without Ramesh and Vignesh who play Chinna Kaakka Muttai and Periya Kaakka Muttai so wonderfully. There’s a lot of fun in the manner by which they (especially the younger kid) go about refusing to be addressed by their original names, so much so that we never know what their real names are, right till the very end of the movie. Both the kids are endearing, managing to appear naughty, vulnerable, smart and witty with remarkable ease. Ultimately Kaakka Muttai is a cinematic triumph for Manikandan and the entire team who have been instrumental in making it such a memorable film. Dhanush and Vetrimaaran certainly need to be commended for backing a film like this that’s quite refreshing in all ways. And it’s good to see Fox Star Studios giving it the right kind of release as well. 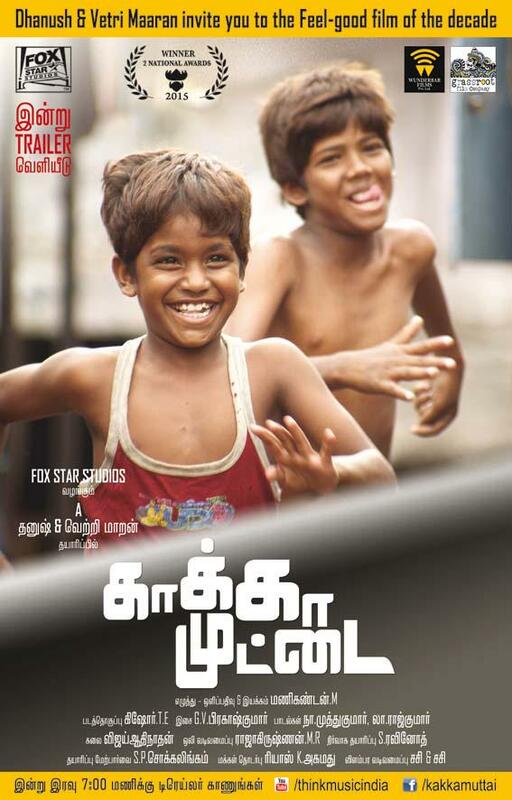 Note-Kaakka Muttai is playing with English subtitles in select screens across the Country. Totally agree with your review Sethu! Ramesh who played Chinna Kaaka Muttai left me mighty impressed! This film has so many lovely moments like the ones you have mentioned. Another one i was really touched was when chinna asks his brother where the crows will live now after that tree gets cut down. Despite losing his source of meal he still has the kindness to worry about the crows that are left homeless. Yes the build up to the climax could have been better. The whole blackmailing sub plot felt like a needless addition. But otherwise it is a lovely little film! Must watch! a wonderful film-hope more & more people get to watch it. The best thing(s) I liked about the movie is that there is no violence, no villain, no item number, no car chase – just pure entertainment in a very subtle way.